Joylette Portlock speaking at the Sustainable Pittsburgh Challenge Finale on March 21, 2019. Photo by Mark Dixon. 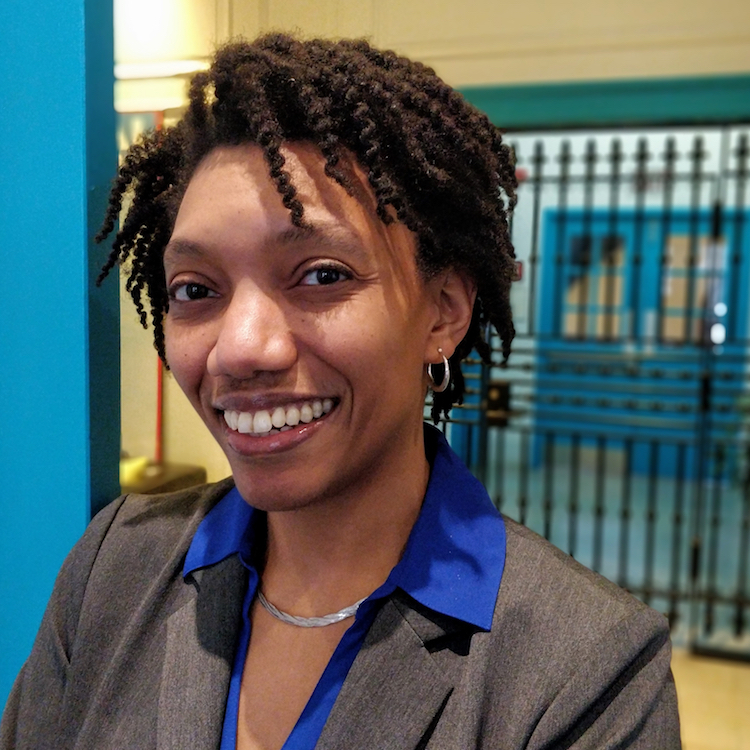 As executive director of Sustainable Pittsburgh, Joylette Portlock works with community and business leaders to incorporate all aspects of sustainability into decision-making: social equity, environmental stewardship and economic prosperity. She previously ran Communitopia, where she starred in a series of funny and informative web videos about climate change called, “Don’t Just Sit There — Do Something!” Originally from Delaware, Joylette lives in Swissvale, where she co-founded the neighborhood’s farmers market. 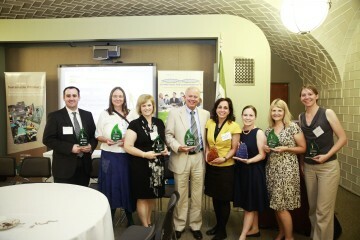 Read about the winners of the 2019 Sustainable Pittsburgh Challenge here. One of the wonderful things about my job is that I get to attend many events that I AM excited to attend. But outside of work for Sustainable Pittsburgh, I’m excited for FutureFest 2019, an all-ages, interactive, future-focused festival and re-use collection event on April 20, co-hosted by Communitopia (full disclosure: I am still on the board there) and Pennsylvania Resources Council. And I see, looking at my calendar that the B-PEP Jazz Festival is right after, on April 22. I was thinking about checking that out, too; who can say no to great jazz? I get to do so many different kinds of intellectually stimulating things. Part of that is the luxury of space in my new role to do some big-picture thinking about what happens next for the organization, which I am afforded because the Sustainable Pittsburgh staff is amazing. If I had to sum it up, I would say courage. Specifically, the courage to see each other’s mistakes and humanity and make space and opportunity for growth. The courage to build a future that respects, but doesn’t necessarily look like our past. We will not get anywhere on any of our pressing sustainability challenges — that includes environment, economy and social equity — unless we can be bold, respect each other and work together. 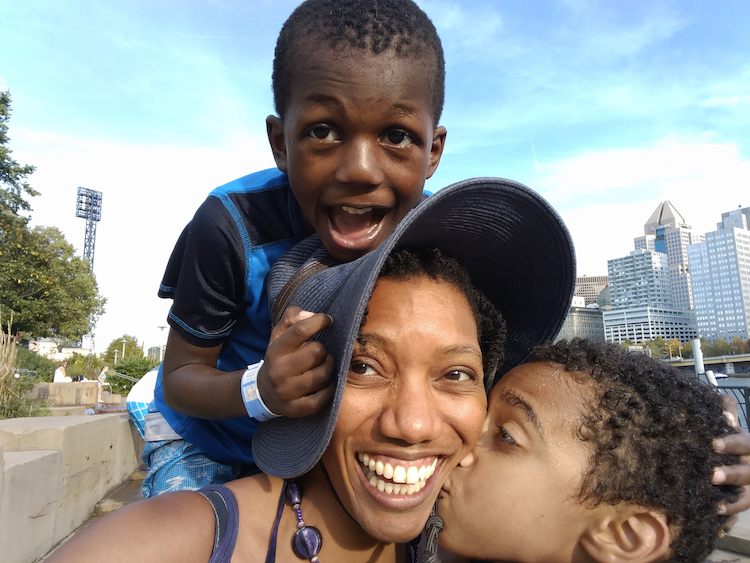 Joylette Portlock enjoying the water steps on the North Side with her kids. There are a lot to choose from; my tastes are pretty diverse. I highly recommend “Lies My Teacher Told Me” for essential historical context; “Bonfire of the Vanities” because it is such an extremely well-told, human story — even the unlikeable characters are relatable; “The Perilous Gard,” which is a truly clever, unexpected young adult novel; and the Harry Potter series, which is fantasy, and fun, and grotesque, and complex, and annoying in places (adolescent angst captured beautifully), and messy and allegorical and multi-layered, and is a must-read because of the take-home message woven through all of that: love wins. Joylette Portlock in the Sustainable Pittsburgh office. Photo by Ginette Walker Vinski. (Channeling Keanu from “The Matrix”) I know kung fu. I’m not sure if that’s surprising, but I have studied wushu for years and have taken classes for the past seven at Win-Win Kung Fu Culture Center in Squirrel Hill. Actually, the MOST surprising thing to anyone who’s known me for the past 25 years or so is that I was a painfully shy kid. Most people I’ve known since can’t even imagine that. Corner Mercantile. It’s right around the corner from our office (and is a designated Sustainable Pittsburgh Restaurant)! Everything they make is amazing and they let you bring your own containers for prepared foods, too. I probably eat there way too much. At home with my kids and boyfriend, snuggling on the couch and watching a movie. 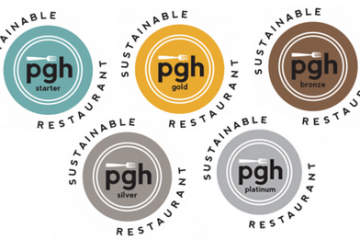 How sustainable is your favorite Pittsburgh restaurant?